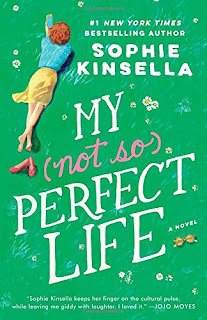 I have been a fan of Sophie Kinsella since I read her single title, Undomestic Goddess. You may know her for her Shopaholic series, and I know people tend to either favorite that series or her single titles, but not always both. So if you tend to avoid her because you’re not a fan of the Shopaholic books, I think you’ll like this one. Katie Brenner is a girl after our own hearts, who wants to pursue her dream of living the ideal London life, even if she has to fake it until she makes it. In fact, Katie--or Cat, as she calls herself in London--is a queen of spin. Even though she works for a woman, Demeter, who makes the boss from The Devil Wears Prada seem angelic, she manages to make her Instagram posts seem like she’s living the high life, even while she’s living in a flat with two other roommates, has to watch every penny in order not to starve, and frequently buys her clothes at low-end or thrift stores. She’s at the entry level of her job at the company and tries her best to navigate the shark-infested climate of a brand/advertising agency, but just as she’s finally getting an invite to the “in” co-workers’ lunch happy hour and getting the boss, Demeter, to listen to some of her ideas, she is laid off due to budget cuts. She reluctantly returns home to Somerset to help her Dad and his wife launch their new career, a “glamping”/B&B business for Londoners who wish to get away to the country, but not exactly leave the wifi or creature comforts behind. Katie (now back to calling herself Katie) succeeds in branding her parents’ company and helping them launch the business off the ground. At night, she scours for new jobs. And did I mention she hasn’t actually told her father she was fired? No. She’s told her parents that she’s on sabbatical with the office for six months, though she’s unsure what she will tell them when those six months are up. While checking in a new set of guests, Katie comes face-to-face with her past, Demeter, who is glamping with her family and doesn’t have the faintest idea who Katie is. (Unsurprising since Demeter never seemed to get anyone’s names correct when they did work in the same office.) When Demeter asks for a special relaxation retreat, Katie embraces the opportunity to get back at her old boss--and she does so in spades. However, it’s while tormenting her boss that Katie realizes that Demeter might actually be a human underneath, after all. As she’s struggling to meld the many sides of Demeter, Demeter’s boss, Alex, a handsome young genius who Katie had a crush on in her previous job-carnation, shows up to meet with Demeter. To fire Demeter. It would seem totally just desserts if it weren’t unjustified. What happens next is the beauty of women who come together to help each other instead of tear each other down, and perhaps enact their own bit of revenge against those who seek to do them harm. Bits of this story reminded me a bit of Undomestic Goddess, which is why for me, this is a Top Dish book. It’s definitely going on my keeper shelf. It’s witty and funny and sweet, but also horrifying and bittersweet and dramatic. Sophie Kinsella certainly kept pulling the rug out on her characters. I highly recommend. 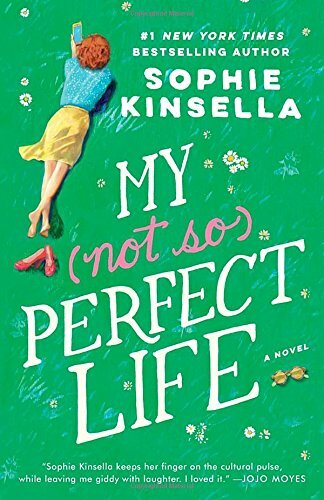 I love all of Sophie Kinsella's standalone books. I particularly like the way that you start out hating the main character and then the author flips you over like a pancake and makes you love them and cheer for them. This one is a bit exceptional in that it is a secondary character whom we grow to know and appreciate. I thought that the comments about painting everything rosy on social media were spot on, we are all guilty of doing a bit of "branding" on our own lives, and I loved Katie's dad and Biddy. The audio version is brilliant and it is a pretty long book, so you get value for money :D Just when you think that everything is wrapped up, there is another episode, which I really enjoyed, because I wasn't ready to leave Katie and Alex quite yet. PS I really don't like the Shopaholic books, so yes, even if you don't like them, try this! Summed it up nicely Hellie. Demeter the boss from hell turns out to have a human side! This is definitely one of her best. Q! I've missed you! Thanks for reading my review! And I'm glad you liked this book as well. I too am a fan of books where women learn to be friends and support one another. Thanks for the review. Sometimes it feels rare for fiction to do that...which I think why it tends to be noted in reviews. *LOL* Maybe it's just reflecting real life. *LOL* Still...I love fiction that does this type of behavior. I always think fiction should show us how to incorporate more of these qualities into our real life. I hope you have room on your TBR pile for this one. Oh, do!! Get this one and the Undomestic Goddess. Seriously, the latter is so hysterical with the chickpea scene...and such a satisfying ending... they're both worth the read. Thanks for the review. I read only one of her Shopaholic books and I passed. I will give this one a try. I hope this one is a better experience. As Bridget said above, usually she makes the heroine very hard to like and then somehow makes you love the character--whereas in this case, it's very easy to like Katie. Let me know what you think! I absolutely adore the UNDOMESTIC GODDESS (I also enjoy the Shopaholic series in doses - hated the movie). Thanks for the rec!